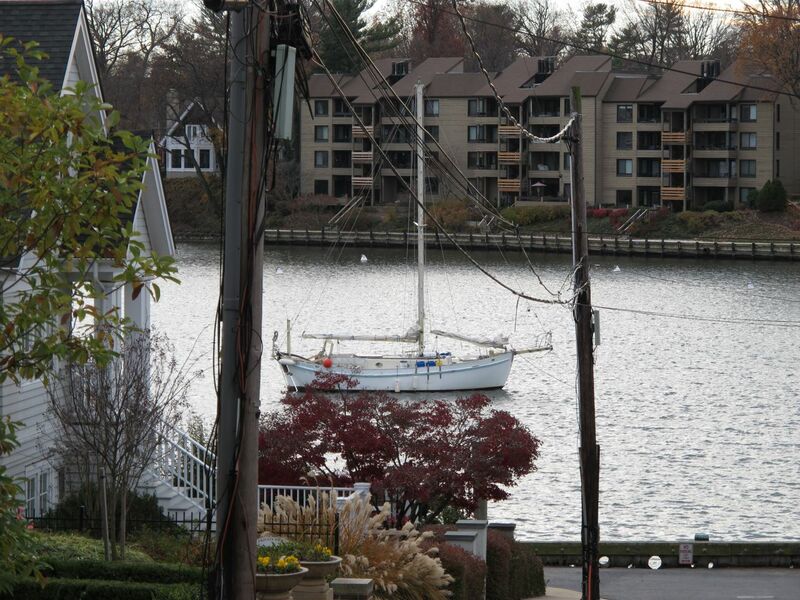 Idle Queen is resting at Solomons, MD, anchored up Back Creek. The air temperature is in the 30’s, the wind is howling out of the northwest, and it is raining. It is time to dig a couple of those rust-spotted cans of creamed corn out of the bilge and turn them into a hot, super-tasty meal. 1 package (about 10-12 ounces) of “side meat”, or other salty, tasty meat of your choice. Sausage, and bacon work well, but the cured “side meat”, which resembles bacon, requires no refrigeration. Canned meat will work, too. Of course the dish can be made without any meat at all, and this is what my parents served when I was young, but adding the meat adds a whole lot of flavor. First, cut the “side meat” or bacon into bite-size pieces and fry in the bottom of a large saucepan. While this is cooking, dice the onion and garlic. Add to pan when cut so they can start cooking and adding their flavors. Cut up the potatoes into pieces about 1/2 inch on a side, and then add them to the pan. Barely cover it all with water–just enough to cook everything. Add the thyme and bring it all to a boil. Reduce heat and simmer until the potatoes and onions are cooked through. When the potatoes are cooked through, add the cream-style corn and cream. Bring it all back to a boil (or just hot if you’re conserving cooking fuel), and then it’s done. Pepper to taste, preferably with fresh-ground peppercorns. Since “side meat” is salt-cured, there is probably no need to add additional salt, but add some if desired to your taste and the ingredients that you used. 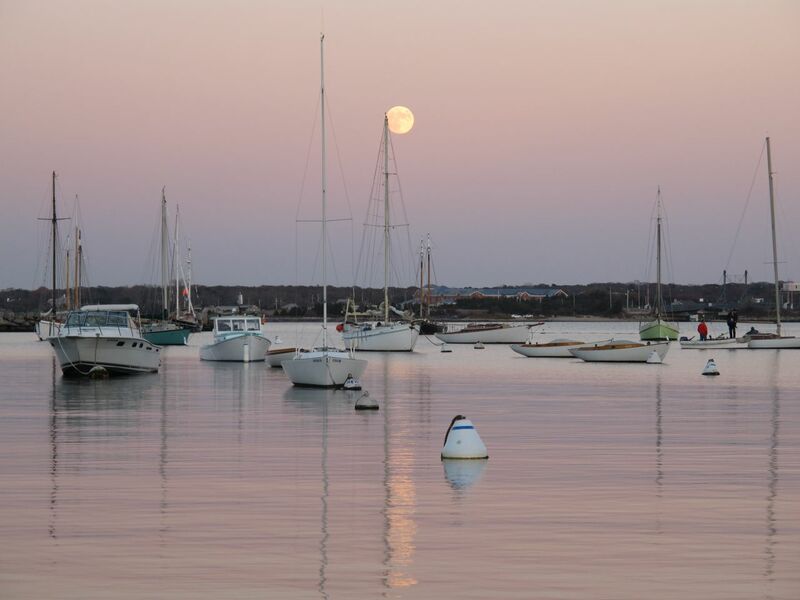 After leaving Martha’s Vineyard, Idle Queen’s bowsprit pointed across a glassy, starlit sea toward the Block Island Light, and later the powerful beacon at Montauk. After a couple of days spent waiting for strong headwinds to blow themselves out, we were left with nothing to stir the sea or fill the sails. Hourly trips to turn the grease cup that lubricates the drive shaft bearing provided a means to mark time on this passage as the engine droned away noisily. 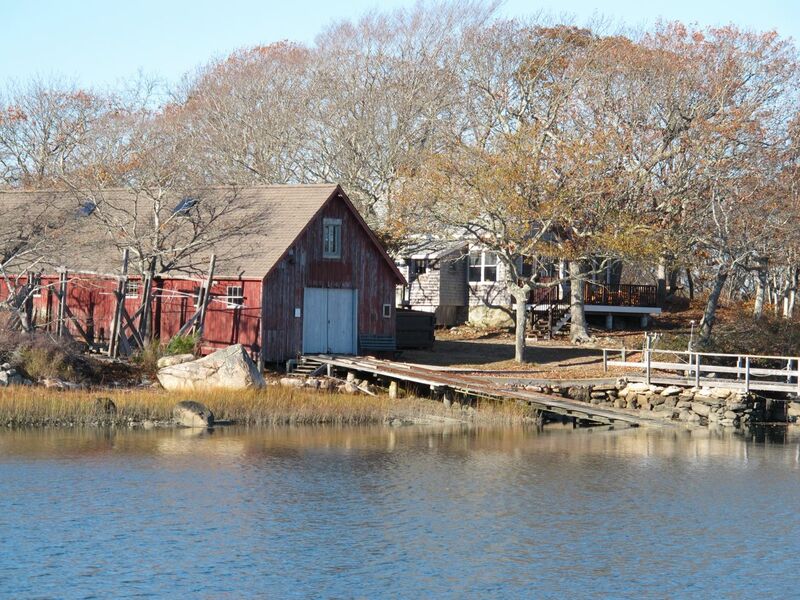 How since we passed Cuttyhunk Island? 5 turns of the grease cup I noted at one point. There were a few brilliant shooting stars that night, providing some excitement when they left trails glowing in the sky where they cut into the atmosphere. We carried a fair tide all the way to the Race, thanks to having picked a good departure time and to the engine for keeping the boat moving. A meaningful amount of wind did not cross the deck until we were on Long Island Sound. I had decided to head up the Sound because a strong cold front was forecast to sweep southward before there was any chance of making it to shelter if we had headed to the south of Long Island, and there was no reason to be caught offshore in the forecast gale that was to follow. 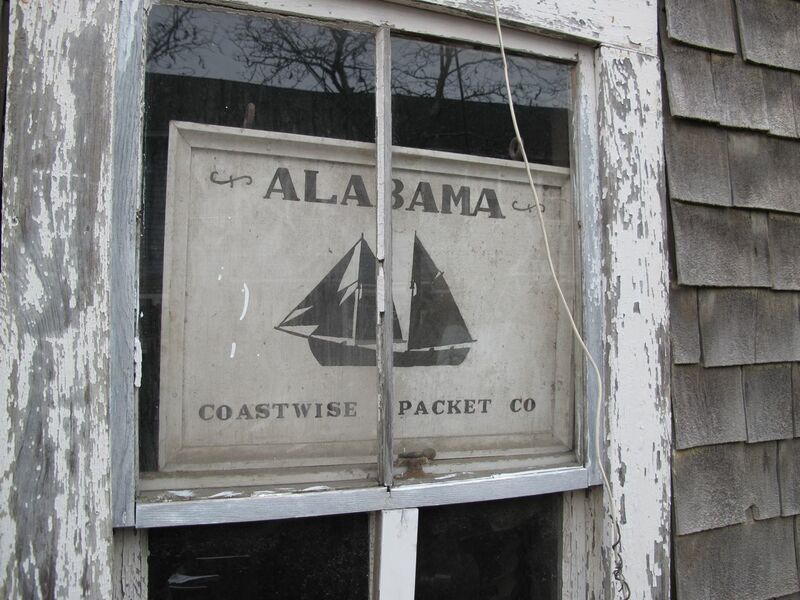 We were hit by the first blast of southwest wind when we were just short of Oyster Bay. I had really hoped to make it to Port Washington, as it would have left us in a favorable position for continuing with a fair wind later. 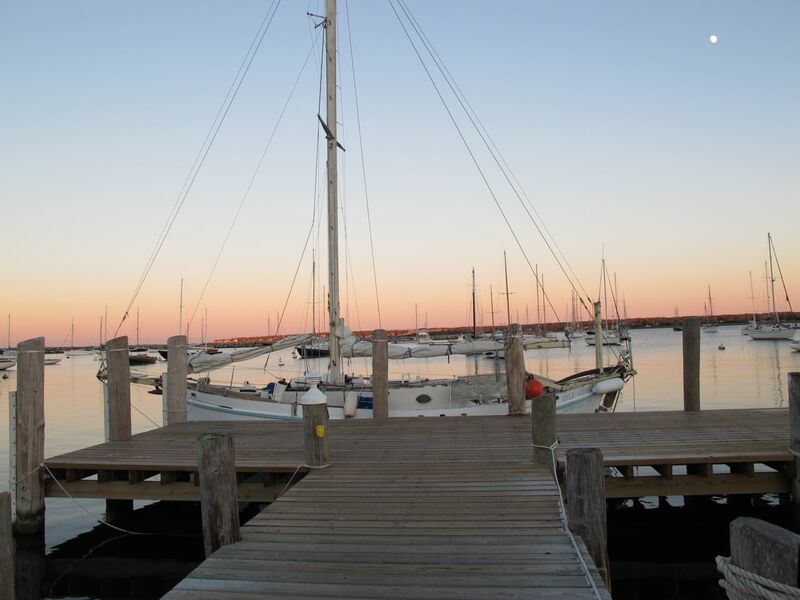 Once the wind built enough to leave Idle Queen overpowered with just a double-reefed mainsail and the staysail, I began to have second thoughts about making it to Port Washington. It’s only 15 miles. We have a fair current. We can make it. It was not to be. Rain came with curtain of fog and blotted out an overtaking tow that I had been watching that was only at that point about a mile astern. We have no radar, and it wouldn’t have done us any good as we pitched and heeled anyway. If I couldn’t see the tugboat’s powerful running lights, they sure couldn’t see the feeble glow from mine. I estimated visibility at about 50 yards. Idle Queen may have been lost in the rain and sea clutter on the tugboat’s radar. Even though they should have passed almost a mile to our north, I didn’t want them worrying about where that sailboat went, so I tacked away to the south, putting us perpendicular to their course and any danger of collision. With visibility so bad, it was time to seek shelter, so I made for Oyster Bay, where we sheltered for an entire day from the howling wind. When we headed out the next morning to try to make it through the East River and out to the Atlantic in order to continue south, the wind was down to about 30 knots out of the northwest. That, however, was enough to make it painfully slow to make it out of Oyster Bay. Idle Queen is not a powerful sailer to windward–her keel is shallow; she has high freeboard to hold her back; and her sails have assumed a very relaxed shape when compared to the nice foil shapes they had when they were new. We can’t power very quickly into a blow, either. The engine is reliable and in good condition, but it is small–we have less than 1.5 hp per ton of boat. Take a headwind and add a short chop, and the result is slow going for Idle Queen. It took almost four hours to claw the three miles to windward so that we could make the turn to continue west on Long Island Sound toward the East River. That put us way behind the tide, so we anchored near City Island to wait for the next ebb to flush us through the East River and down New York Harbor. We would do that leg at night. After breaking the anchor out of the thick, oyster-studded mire at City Island, I stood in the cockpit and motored toward the Throgs Neck Bridge. My hands went numb after just a few minutes, despite doing my best to avoid exposing them to the below-freezing might air. I needed to frequently pull out my flashlight to check my position and verify the upcoming lights, and the switch on the flashlight was too small to push when my hands were in gloves. With the exception of a moment’s confusion near Riker’s Island (where a few channels come together), the trip went smoothly. With a fast-running fair current and many rocks lurking in the dark, it only takes a moment’s confusion for the boat to end up against something solid. Fortunately, I figured the marks out and avoided getting into shallow water. We ran the gauntlet between ships, tows, ferries, and patrol craft and made it down New York Harbor to where it meets the sea at Ambrose Channel. There, I enjoyed the wide, well-marked channel with few background lights to confuse after the hectic hours in the East River and New York Harbor. The wind was fair and whipping, so I set the staysail. We sailed into the Atlantic and turned right, making 5 knots with very little canvas set. Dawn found us well past Sandy Hook. As the wind lightened, I set first a double-reefed, and later the full mainsail. Progress was good, but the ride was bumpy, with Idle Queen bouncing uncomfortably down the 4-6 foot swells. We were moving well and my spirits were high, despite an uneasy stomach. Maybe it was that can of peaches I ate earlier. I shouldn’t have felt so queasy given the conditions. Late that night, with the incredibly huge video screen of Atlantic City still visible, I finally had to give in to my body and void my stomach. I am not sure what caused me to get sick, but it took a few hours to get over. Probably something that I ate. Feeling a bit weak, and with the forecast calling for headwinds the next day, I decided to turn in to Cape May and head up the Delaware Bay. We fueled up at Utsch’s Marina, where I spent a short while chatting with the owner about the weather and the declining state of the pleasure boating business. “Ten years ago, all of these marinas had more transients than they could handle,” he said, sweeping his hand through an arc past at least three other big marinas. “Now, we don’t have half the business we were doing back then.” He knew that he was part of a dwindling number of family-run marinas, and seemed to indicate that he could already imagine the day when he couldn’t make it pay anymore. I was thankful to have given him my business, though it was just a small fuel sale. We continued on our way with some helpful tips about the Delaware Bay and a free cup of coffee. The fair tide carried us to the Upper Bay, where we anchored not far from a nuclear power plant. We were completely exposed, with miles of fetch in every direction, but the water was calm by this point. The whole trip from Cape May had, at the most, about 10 knots of wind, which was on the nose, of course. After the sun set, the water was glassy. It was wonderful to be able to catch a couple of hours of sleep before the tide turned once again and we continued on through the Chesapeake and Delaware Canal at night. Daybreak brought more headwinds. Fortunately, they were light and we were able to motor the rest of the way to Annapolis without ever having our speed over the ground fall much below 3 knots. Yeah, I am happy as long as the boat is at least moving at a good walking speed. 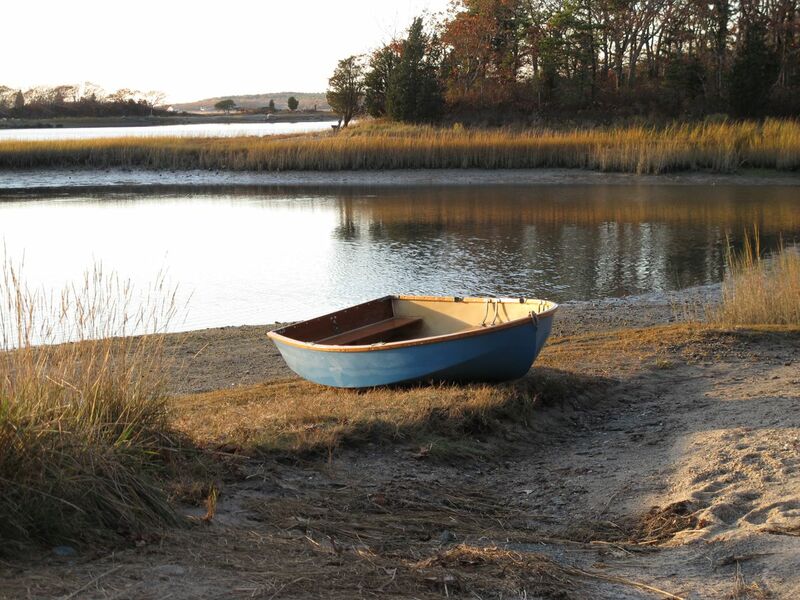 We worked the shallows to avoid the flood tide, and stayed in deep water to get a push from the ebb. It was about 3 in the afternoon when we motored under the drawbridge to enter Spa Creek. It was time to take a break… The forecast called for freezing temperatures and gale-force winds. It blew hard all day today, but the wind is tapering off now. With a couple of days rest and freshly-laundered clothes, we are again ready to continue our journey south. The current plan is to leave tomorrow morning and see how far we make it before the wind turns on us again. Idle Queen’s mast is touching the moon! Just a few words here, as I am about to pull anchor to head through the East River, down New York Harbor, and hopefully onward to either Delaware Bay or the mouth of the Chesapeake. We had an easy run from Martha’s Vineyard most of the way up Long Island Sound before an approaching front brought fog, rain, and 50-mile per hour gusts. We staggered into Oyster Bay (from where I am writing now) quite overpowered though we were only flying a double-reefed mainsail and the staysail. There were a few scary moments shortly before we found the harbor when an overtaking tug and barge disappeared into a particularly thick pocket of rain. They had looked to be passing us to starboard, so I tacked away to head far from the course I anticipated they would continue. The scary part was that I had no confirmation until the rain let up 10 minutes later. By then, we were probably 1.5 miles from their track. Whew. Those of you who have been following Setforsea on Facebook know that we are now in Vineyard Haven waiting for today’s southwesterly wind to turn around to the southeast so that we can quickly cross Block Island Sound and make some meaningful progress on our trip south in search of warmer winter weather. I have recently been following the pattern of only checking in on the Facebook page, so there is quite a bit there that hasn’t been published here. There hasn’t been much in the way of sailing travels to write about in the past couple of months, as the time was mostly spent visiting with family and friends, but Idle Queen is now on the move again for more than just daysails. 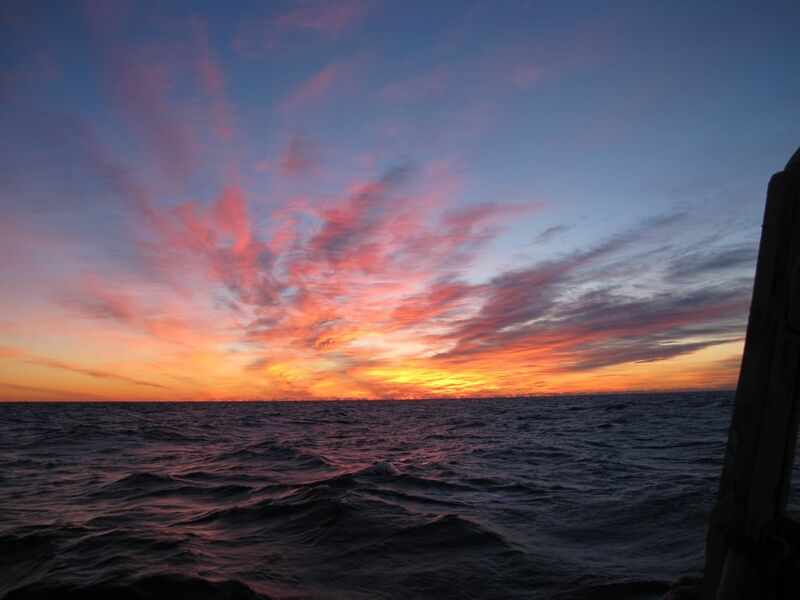 It feels great to have the bowsprit pointed south; to be poring over charts to pick the next anchorage; and have the day’s activities again dictated by the weather. Recently, we careened the boat to clean the prop and change zincs; beat down Buzzard’s Bay to Hadley’s Harbor, where we got stuck for two days when an Arctic front brought sub-freezing temperatures, gusty winds, and snow; and then sailed to Martha’s Vineyard where we are waiting on better weather for heading south. Of course, Idle Queen and her gear weren’t forgotten while she rested on a sheltered mooring through September and October. She was visited almost every day to make sure that she was secure. Her sails were removed and washed, and many other pieces of gear were taken ashore for cleaning. A good portion my time was spent rebuilding the little Dyer “Midget” that I bought to have a hard-bottomed tender. Every piece of the boat needed to be redone, as I had purchased only an empty fiberglass shell, some pieces of wood, and a bag of hardware. Read about the restoration here. I put together a video from footage taken during a daysail this summer on Buzzard’s Bay that shows Idle Queen charging right along. It can be viewed below, or on the Setforsea YouTube channel. The newly-rebuilt Dyer on the shore of Little Bay. The little Dyer (actually a Dyer “Midget” low-sheer) was a restoration project that had been started by someone else when I found it. The disassembly portion of the work was complete. I had bought a pile of parts with no instructions, leaving me scratching my head over what to do next. On our way north this summer, we stopped in at the Dyer factory in Warren, RI, to buy pre-bent pieces of wood that would be fashioned into the new rubrail and clamp. These pieces give the dinghy most of its strength; provide a place for attaching the oarlocks and hanging knees (for the thwarts), and generally hold the boat in its proper shape. 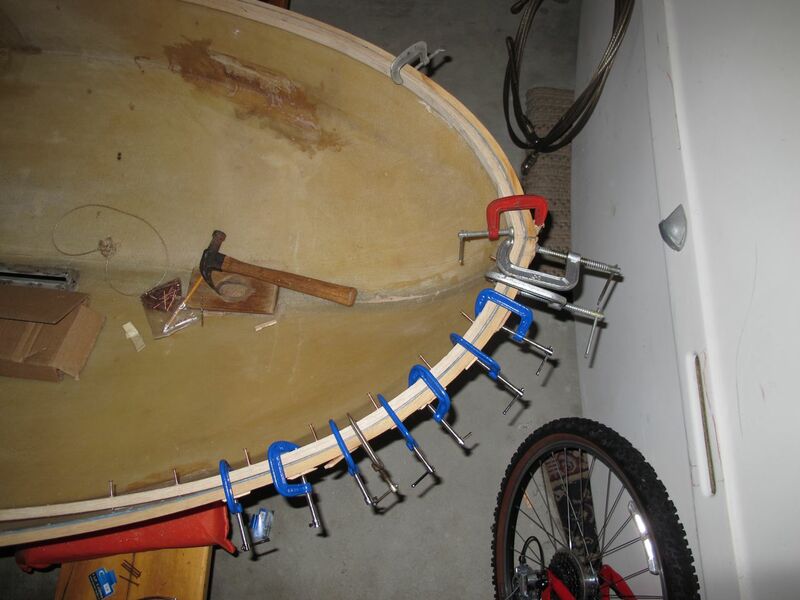 Before departing North Carolina, I had already experimented with trying to bend thin pieces of wood around the fiberglass shell to try to laminate a new rubrail. The thin, unsupported fiberglass hull complained and deformed under the load of trying to bend even 1/8″ wood around its edge. After those efforts, I decided that it would not be worth the time to try to save the cost of purchasing new, strong, steam-bent pieces of white oak from the factory. Otherwise, I would need to build a support for the hull to hold it in the proper shape with enough strength to form the new rubrails around it. The stop at the Dyer factory was worth it. 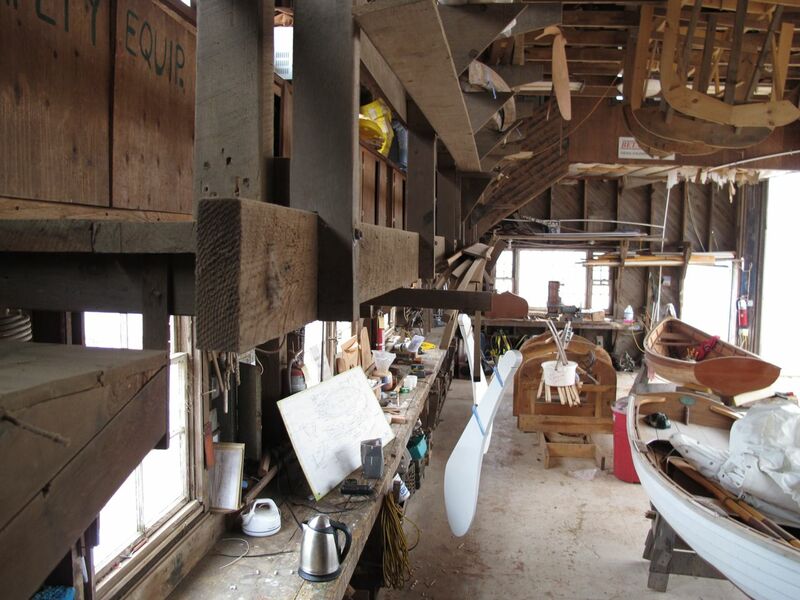 They provided heaps of information about how to go about the reconstruction of my dinghy, gave a tour of the factory working areas, recounted much about the history of the Dyer dinghies, and answered every question that I could come up with. I took a couple of pictures of some of the construction details that I knew I would have trouble with later, but as soon as I was observed to be taking pictures, I was told that they didn’t want me to take any more. Dyer doesn’t mind sharing most of their secrets, but they probably don’t want someone publishing the details. That is more than fair. I wasn’t asked to delete the pictures that I had taken, though I had offered to do so, and for that I am thankful, as they did help me work out some details during the rebuild. I won’t publish the pictures that they let me take, so all of the pictures here are of my own boat at home. 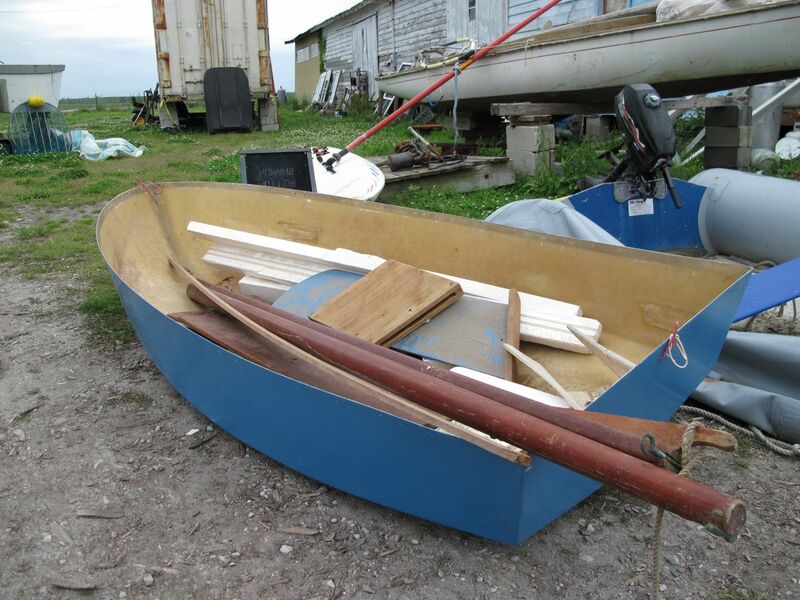 Dyer also provided measurements for the placement of all the hardware in the boat, which was particularly helpful, as I had not seen my dinghy before it had been taken to pieces. Fitting the new guard at the bow. It doesn’t want to bend like that! The rebuilding process was not quite as straightforward as I had hoped. Fitting the new rubrail (the “guard”, which goes around the outside rim of the hull), and clamp (which goes around the inside of the hull) was more complicated than just putting them in place and hand-peening nearly 100 copper rivets. The new pieces of steam-bent white oak still needed a fair amount of coaxing and a bit of shaping to fit the hull. 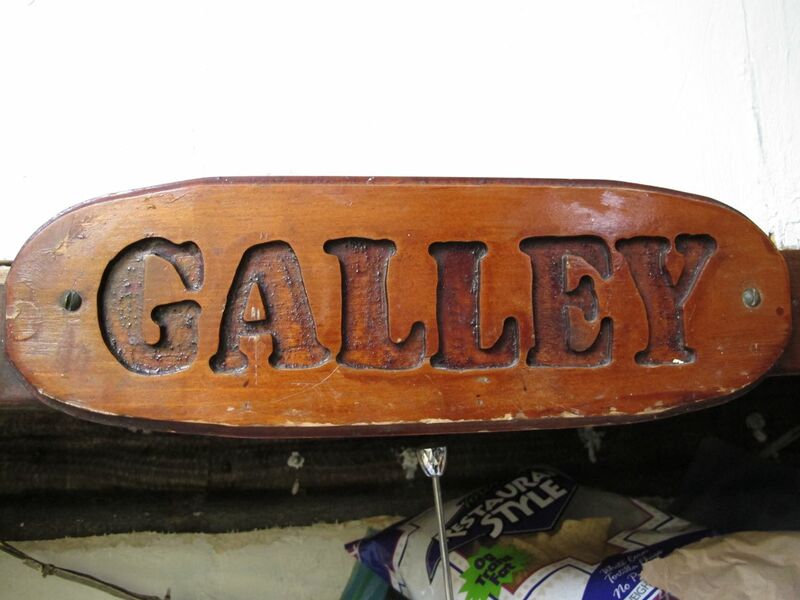 “New” transom board made from the old center thwart. 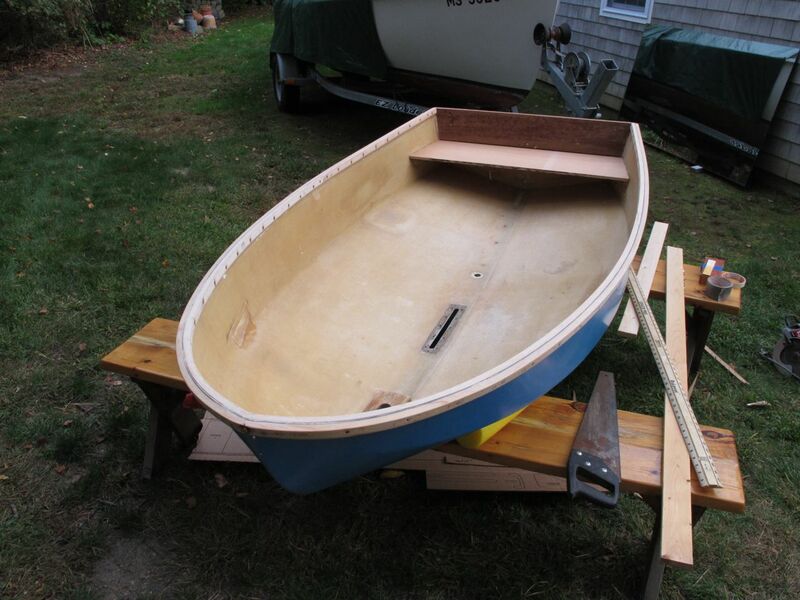 I started by turning the old aft thwart into a new transom by trimming it to size, as the old transom did not come with the boat. It had presumably rotted away. The new transom piece is a bit thinner than the original, and has some “character” from its former life as a thwart. It was bedded in place, but not glued, as the factory told me that gluing can cause problems in the future if the piece ever needs to be replaced again. The next task was to fit the new gunwhale clamp and guard. Dyer provides them as a kit, which is comprised of the wood, copper rivets, a couple of wood plugs and screws, and instructions. First, I sanded and planed the inside, bottom edge of the forward part of the clamp so that it would fit into place against the compound curve of the hull. Dyer had instructed me to do this, but I had to remove a bit more material than I would have guessed. The forward part of the clamp was drilled to accept rivets, using the old holes in the hull as a guide. The port-side guard was then held in place with “C” clamps and drilled to accept the rivets. This sounds easier than it was, as the curve at the very end of the bow was tighter than the bend in the new piece of wood. I bent a few of my small, cheap “C” clamps trying to get enough pressure on that piece to get it firmly into place. Rivets were placed before fitting the starboard guard, which also resisted a tight fit at the bow. No matter how I tried, when I put the starboard guard in place, a small gap would open up where the two pieces butted together at the bow, as pressure from the new wood pieces changed the shape of the hull slightly. In the end, after a few attempts, I got the gap down to around 1/16 of an inch, which I can live with. Almost finished fitting the new clamp and guard! The remaining pieces of the clamp and guard were trimmed, fit into place, drilled, and riveted following the excellent instructions provided by Dyer. I won’t go into all of the details here, because Dyer has already got this covered. 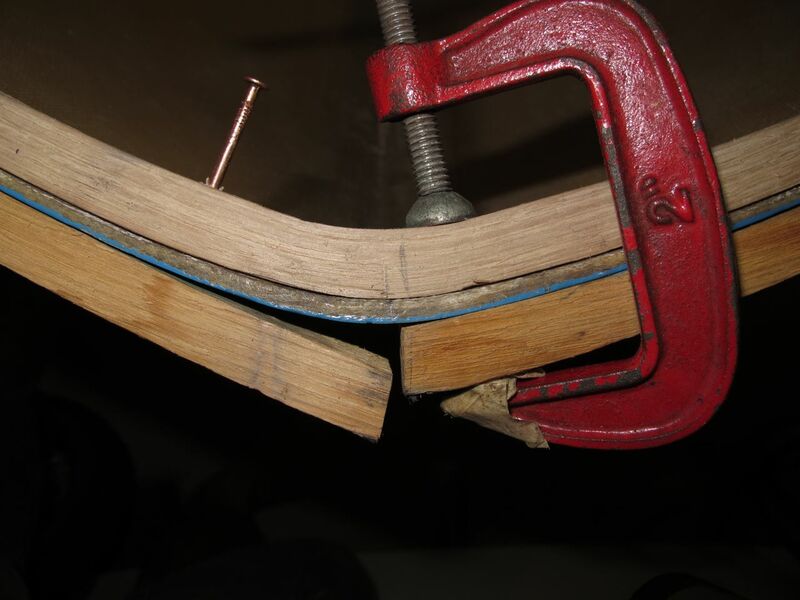 Fitting the aft sections of the clamp and guard was easy when compared with the frustratingly difficult bow sections. The whole process took me probably about 30 hours of work spread over about a week. I had to frequently step back to figure out how exactly to proceed with one detail or another, and the fitting process took me a long time, as I don’t have much experience shaping and working with wood. Rubrail complete. Cutting new aft thwart; skeg; etc. Once the clamp and guard were in place, the little Dyer had some strength to its form and could be moved around much easier than before. Now it was time to cut new pieces for the aft thwart; skeg; and daggerboard case support. These were made out of some marine plywood I had left over from another project. 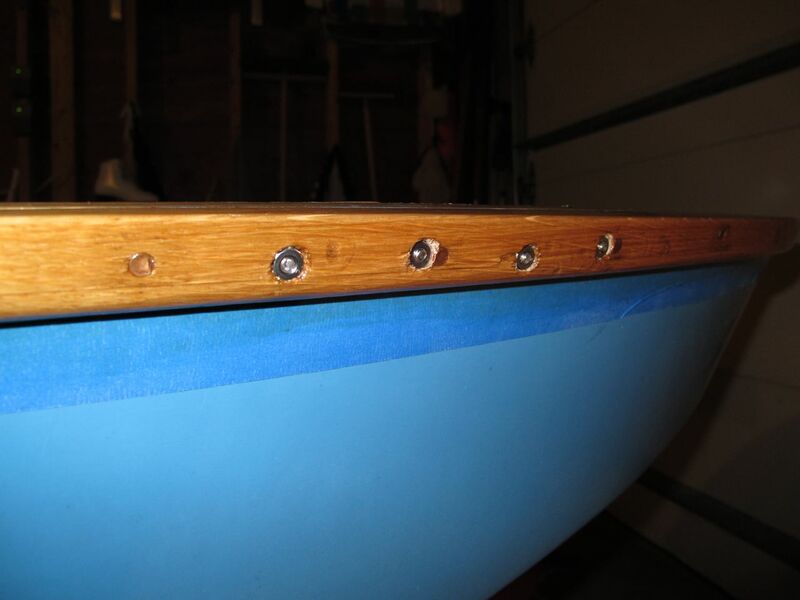 The aft thwart is lightly glassed in place from below with a small amount of tabbing, as I was shown by Dyer, and has a vertical support in the center to transfer loads to the keel. I had coated the underside of the new thwart with epoxy before tabbing it into place, and I had to use a heater to get the epoxy to cure, as the days were too cold for it to work properly. This almost caused a disaster, as the thwart warped from the combination of heat and uneven sealing. Luckily, I caught the problem before the epoxy was hard. I was able to wedge the thwart back into the proper shape. Once the epoxy cured, it was fine. Had I not caught it, I would have had to cut the piece out; clean up all the surfaces, and start that portion of the project over again. I built the new skeg from two thicknesses of my piece of leftover plywood. It was carefully fit to the bottom of the boat. Further, I protected the boat with mylar tape where the skeg would sit, and then coated it with epoxy; pushed it in place; and let it cure. 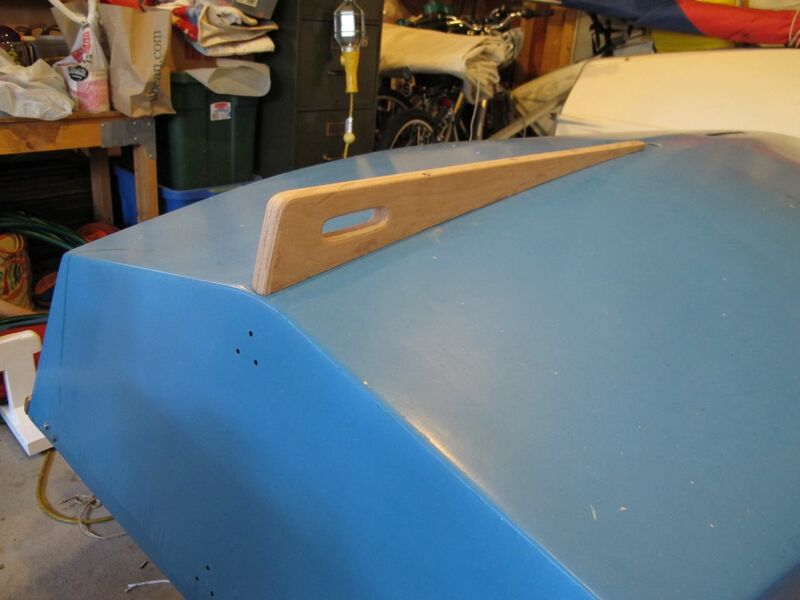 This provides a perfect fit and a solid base for the skeg. Holes were drilled for bolts sent in from the bottom of the skeg. The aft-most bolt does not go all the way through the skeg, as I couldn’t find one long enough. Instead, I potted a 3 1/2 inch machine screw in thickened epoxy. They are backed up by nuts and big fender washers on the inside to avoid over-stressing the hull if a heavy load ever gets placed on the skeg. The boat showed old signs of stress-cracks in the skeg-attachment area, so I decided on this attachment method, which differs from the factory. They use screws from the inside of the boat. The skeg got 4 layers of 6-ounce fiberglass cloth and epoxy on the bottom to protect it from the wear it will eventually see on beaches. I finished it with white Interlux Brightsides polyurethane. Fitting all of the hardware. 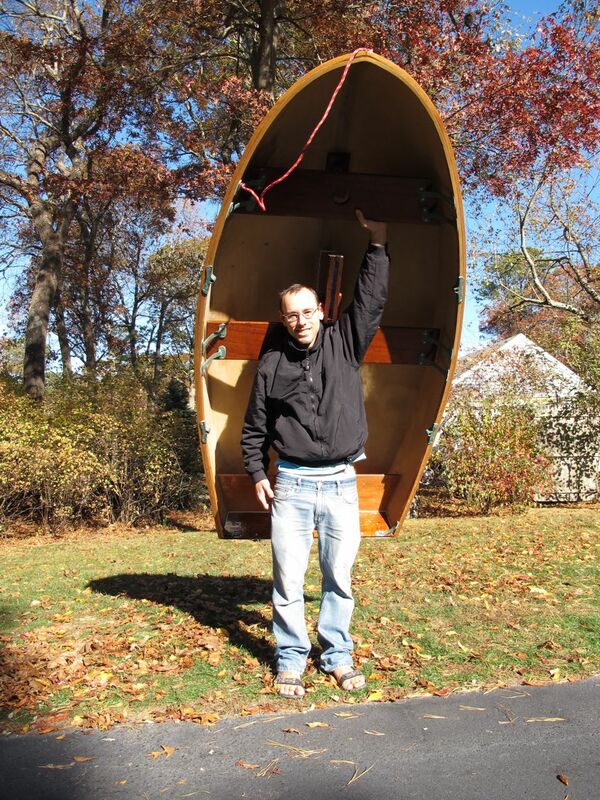 There are hundreds of fasteners in this 7′ 9″ boat! With the glass-work complete, I moved on to fitting the hardware that attaches the remaining two thwarts into the boat. I didn’t have bronze screws, so I bought new stainless fasteners. I wanted the strength of bolts for the hanging knees and breast-hooks, so I sunk washers into the new rubrail. It would have saved many hours of work to just have sent the bolts in from the outside, but the bronze pieces were all countersunk for screws. I wanted the strength of good contact with the shoulder of the countersinking, so I sent the bolts (actually machine screws) through from that side. Each fastener had to be cut to length and the threads cleaned up so that it would thread into its mating nut. 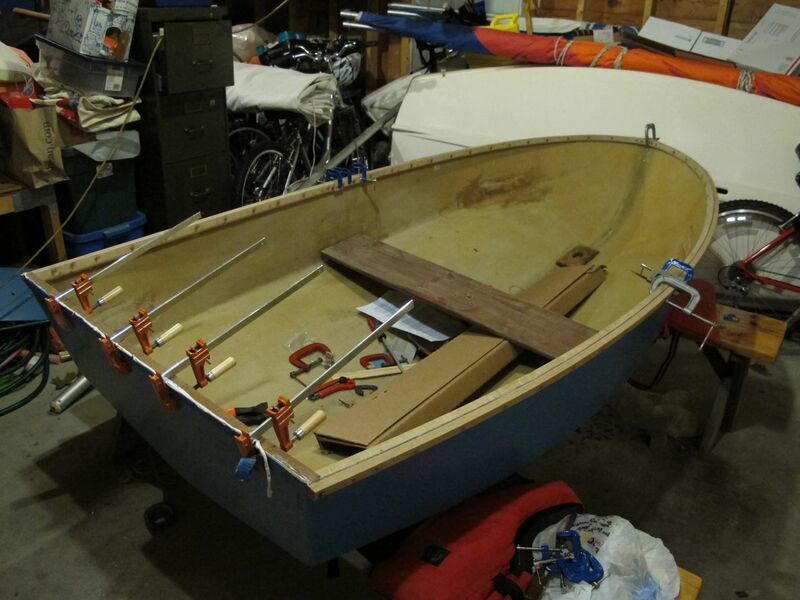 I assembled the whole boat, including the daggerboard case and the piece that ties it to the center thwart, to make sure that everything fit properly. Then, I took it all apart. 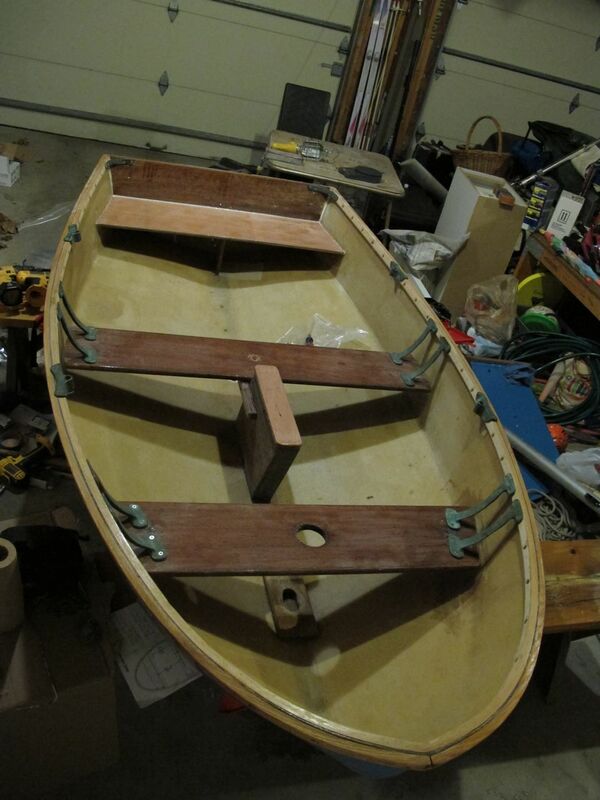 The new wood was all given at least three coats of varnish, and all of the plywood pieces were sealed with epoxy in addition to varnish (or paint for the skeg). Only then was everything finally fitted with bedding compound. I am sure that I could have built a simple dinghy for the hours that I put into this project, but now that I have used my “new” Dyer for a week, I feel that it was worth it. These dinghies have been in production for more than 50 years for good reason. They are wonderful tenders–lightweight; tough; reasonably fast; and relatively stable while providing good carrying capacity. 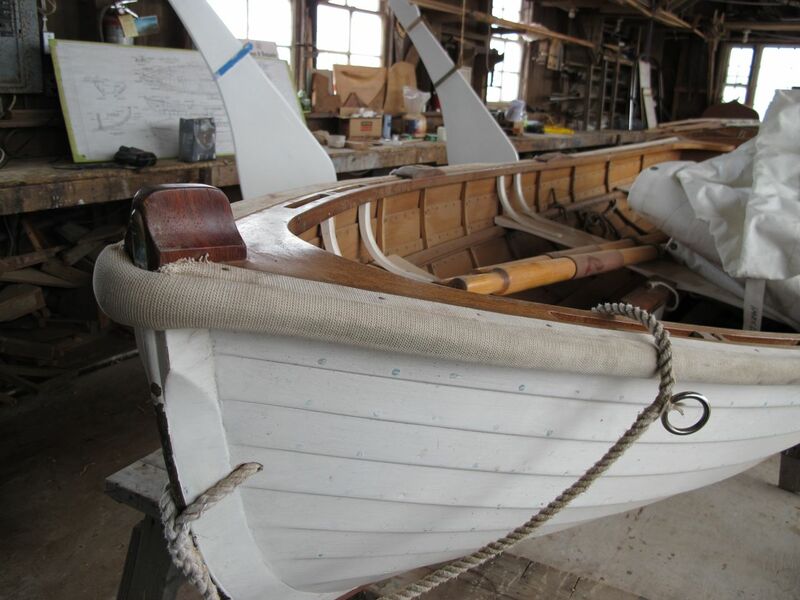 The Dyer factory is an outstanding resource, and will provide parts, and answers to any questions you might have if you are ever tempted to do as I did and restore one of their great little dinghies. Fits in a station wagon! The empty hull. Lots of work ahead. All pieces of the new clamp and guard in place! Boat covered to keep the heat in. It was too cold for the epoxy to cure without extra heat. ‘Glassing the skeg. I wrapped it in plastic an weighted clamped it to squeeze out any extra resin. 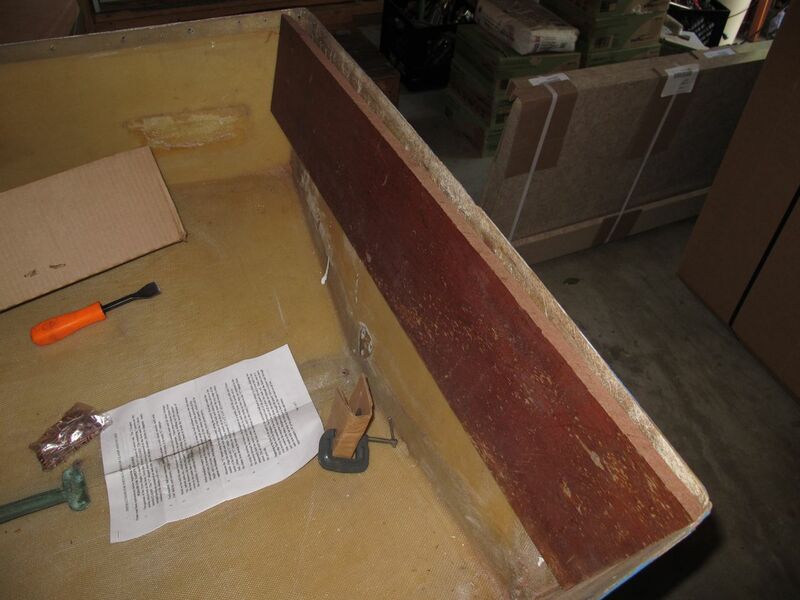 The hull separated from the transom board because of heat used to cure the epoxy. I added bolts and more bedding compound to fix this. Varnish on all of the new wood.